Click a cover to explore it. Kevin Kwan was born and raised in Singapore, where he attended Anglo-Chinese School in the mornings and spent his afternoons either hiding from his Chinese tutor or chasing after neighborhood dogs on his bike. When he was eleven, he moved to the United States, where the next few years were a blur of trying to survive high school, reading too much F. Scott Fitzgerald and Joan Didion, and dreaming of living in New York. 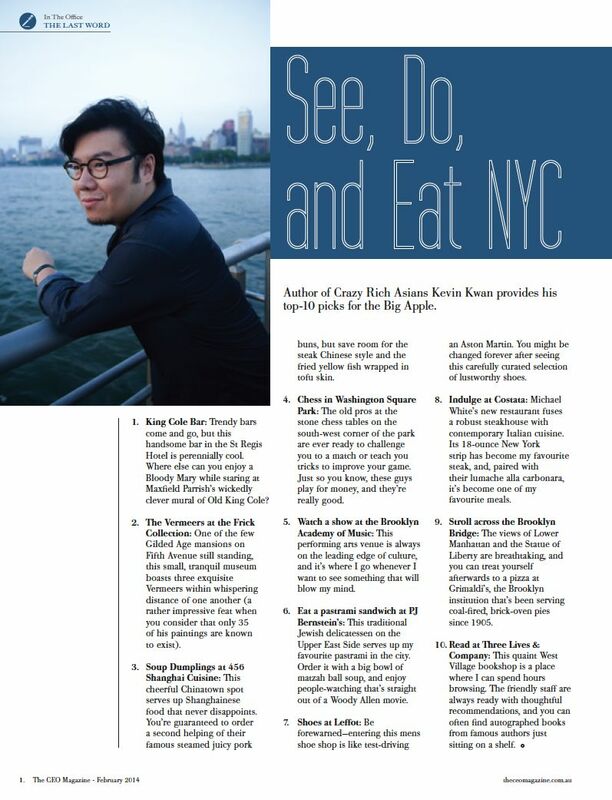 After obtaining his first degree in creative writing from the University of Houston, Kevin moved to Manhattan to pursue a BFA at Parsons School of Design. Kevin's early years in the city were spent working for Martha Stewart Living, Andy Warhol's Interview magazine, and M&Co, the legendary design firm founded by Tibor Kalman. In 2000, Kevin established his own creative studio, where he specialized in producing high profile visual projects for clients such as the New York Times, the Museum of Modern Art, Rockwell Group, and TED.com. Many unforgettable experiences followed, like creating the ultimate publishing tribute to Oprah Winfrey's groundbreaking television show, handling Elizabeth Taylor's fabled jewel collection while producing Elizabeth Taylor: My Love Affair with Jewelry, and serving as the visual consultant for the re-launch of the TED website, which exceeded a billion views in November 2012. Throughout all this, Kevin always remained passionate about books. As he became sought after as a visual consultant by acclaimed authors like Michael Korda, Gore Vidal, and Larry McMurtry, Kevin was inspired to return to his first love—writing. His critically-acclaimed debut novel Crazy Rich Asians became an international bestseller in 2013 and is now being made into a major motion picture by director Jon M. Chu and Warner Brothers Studios. Its sequel China Rich Girlfriend also became a smash hit around the world, and the final book in the trilogy, Rich People Problems, was released in May 2017. Kevin still resides in Manhattan, eats too much pasta, and these days dreams of living in Italy.